The proximity to so many things to sightsee. Things to do in walking distance. Where to find Los Angeles hotels near an airport? How can I find hotels in different Los Angeles neighborhoods? 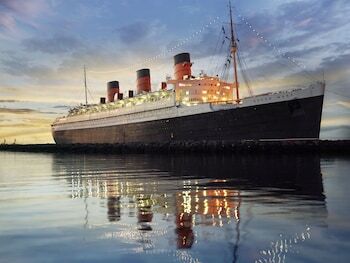 Where can I find hotels in Los Angeles that are near tourist attractions? 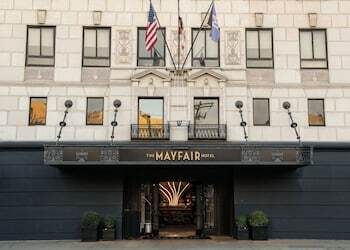 If you are deciding on where to stay in Los Angeles, you will find an extensive range of suitable options to choose from. Expedia features 168 hotels and other accommodation options that are within a 0.1-kilometre (0.1-mile) radius of downtown Los Angeles. 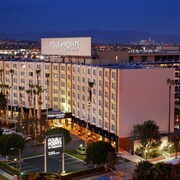 The more central lodgings of downtown Los Angeles are The Standard Downtown LA and Sheraton Grand Los Angeles. 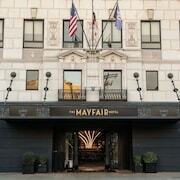 A great place to stay in is Downtown Los Angeles. Downtown Los Angeles is 0.1 kilometres (0.1 miles) from downtown, and has 89 Expedia-listed hotels. 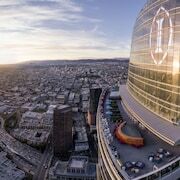 Some of the places to base yourself in Downtown Los Angeles include The Ritz-Carlton, Los Angeles and JW Marriott Los Angeles L.A. LIVE. 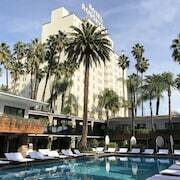 Travelers will also find comfortable establishments in Los Angeles. This neighborhood is 0.1 kilometres (0.1 miles) from downtown. Some of the better known Los Angeles establishments are the Hotel Bel-Air and Four Seasons Los Angeles at Beverly Hills. Another popular place to stay is Santa Monica. Santa Monica is home to the Oceana Beach Club Hotel and Viceroy Santa Monica. Or, you could try Universal City, where you'll find the Sheraton Universal Hotel and Hilton Los Angeles/Universal City. Venice is 20 kilometres (12 miles) from Los Angeles' downtown, while Long Beach is 30 kilometres (19 miles) from the heart of Los Angeles. 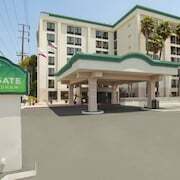 The Hotel Erwin and Su Casa at Venice Beach can be found in Venice, while the Hyatt Centric The Pike Long Beach and Residence Inn by Marriott Downtown Long Beach are situated in Long Beach. Universal Studios is one of the more popular attractions in Los Angeles. 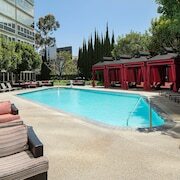 The Sunset Tower Hotel and The Redbury @ Hollywood and Vine, are within easy walking distance of Universal Studios. 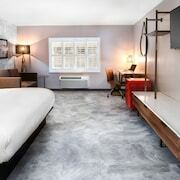 Enjoy accommodation close to The Grove by booking a hotel room at the SLS Hotel, a Luxury Collection Hotel, Beverly Hills or, alternatively, the Sunset Marquis. If you would prefer to make a base near Griffith Observatory, you should try the W Hollywood or the Hollywood Pensione. The Los Angeles County Museum of Art, another important Los Angeles attraction, is walking distance from the Sofitel LA at Beverly Hills and the Petit Ermitage. Accommodation options that are near the California Science Center include the Radisson at USC, Los Angeles and the Vagabond Inn Los Angeles-USC. Echo Park and the Grammy Museum both have hotels nearby. The Omni Los Angeles Hotel at California Plaza and Hilton Checkers are close to Echo Park, while The Los Angeles Athletic Club and DoubleTree by Hilton Hotel Los Angeles Downtown are close to the Grammy Museum. Accommodation options close to the Orpheum Theatre include The LA Hotel Downtown and The Westin Bonaventure Hotel and Suites, Los Angeles. Alternatively, if your focus is on MacArthur Park, your nearby hotel options include The LINE Hotel and Sunshine Suites at 616 St. Paul. Los Angeles International Airport is a logical airport for flying in and out of Los Angeles. It is 18 kilometres (11 miles) drive away. 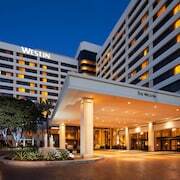 If you would like to stay nearby, try the Inn at Playa del Rey or Hotel MdR Marina del Rey – a DoubleTree by Hilton. What are the most popular Los Angeles hotels? Are there hotels in other cities near Los Angeles? 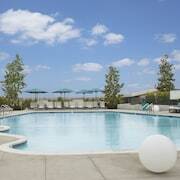 What other types of accommodations are available in Los Angeles? Explore Los Angeles with Expedia.ca’s Travel Guides to find the best flights, cars, holiday packages and more!